We talk a lot about academic programming and school performance. However, something we don't talk about as much, but is a critical component to a thriving school, is school culture. At Englewood Schools, we are committed to fostering positive and healthy school culture. What makes a strong school culture? School culture is about several things, most importantly: connections, relationships, behavior, values, and norms. Our students play an important role in building a strong school and classroom culture, and it's our job as adults to model the way for what positive behavior and practices look like. At Englewood Schools, positive school culture and climate is fostered through three areas of focus: Positive Behavioral Interventions and Supports (PBIS), Restorative Practices, and Trauma Informed Practices. Each school community is unique. Culture can look different from school to school, and even classroom to classroom. This is because the classroom is a community within the community of a school. And our schools are communities within the larger community of the school district. It's important to honor individual school and classroom cultures by catering practices to fit the needs of students. Below is a summary of our district's culture building focuses, along with examples of what this work looks like at different schools. Trauma Informed Practices is the work educators and school leaders do to set up school environments to support all kids. Fostering an environment that meets students where they are, especially those who have experienced trauma in their lives, is a critical component to setting students up for success. We accomplish this by creating a calm and predictable learning environment where every student feels safe, engaged, and supported. This can include adjusting various physical factors such as lighting and sound levels. Additionally we strive to understand "the why" behind behaviors so we can find solutions rather than dwell on the problems. This allows our students to be nurtured while also holding them to high expectations. PBIS is the practice our schools use to help students know and understand what positive behavior looks like at school. For example, students know what hallway, playground and recess behavior looks like and sounds like. They know what it looks like and sounds like in the lunchroom because clear expectations have been set, and our staff are modeling the way for our students. The practice of PBIS can look different at each school. Bishop, Cherrelyn and Englewood Middle School, for example, award tickets to students who demonstrate positive behavior. Students earn these tickets to be exchanged for different age-appropriate incentives. The modeling and incentives for positive behavior will vary from school to school because educators cater to the needs and motivations of their students and to the culture of the school. In Englewood Schools, Restorative Practices is a philosophy and thoughtful approach to building positive relationships and school communities. It's about teaching students to understand the power and influence they have within their community of peers and that each person has a voice that is respected. This helps to build a respectful school culture. Cherrelyn Elementary's daily sharing circle gives a positive start to each school day. Through Restorative Practices, students build key life skills such as empathy, responsibilityand the ability to solve problems. As is the case with PBIS, Restorative Practices can look different at each school. All schools are engaging in community building circles. Circle time is an effective way of building relationships by encouraging students to share with each other and to learn from and about each other. Some schools take the circle work to more advanced levels. For example, some of our schools are doing academic circles where students have an opportunity to share their knowledge with each other. Some are using them as resolution circles to help students solve concerns in the classroom. Another example is that students can voice their ideas about classroom norms and agreements and come together to agree on what those should be and why. This work is teaching our students to be stewards for their peers and community. It teaches them to be leaders in their classrooms and schools and to learn about the power of their voice. Restorative Practices help our students to grow into thoughtful, empowered and confident people in our community. An important component of Restorative Practices is teaching students to resolve problems, make amends when they behave inappropriately or harm someone, and to re-establish healthy relationships. One of the ways students learn to do this is by using affective statements. Affective statements help to shape constructive conversations by asking: what happened? Who has been harmed and how can we right the harm? It's about allowing our students to learn from their mistakes. It's also about helping our students voice how they can correct the harm to those involved. Lastly, it's about the consequences fitting the actions. Through Restorative Practices, our educators are more thoughtful about how conflicts and consequences can be learning lessons for students. Two fourth-grade students in the cafeteria created a mess with their food due to their behavior at lunch. After speaking with both students and the staff in the cafeteria it was agreed upon the students would stay after their lunch for 15 minutes for one week and help clean the cafeteria before going back to class. Three 9th grade students arrived to their science class late multiple times and when they did get to class they were consistently disrupting the class. The teacher had a restorative conversation with them and they all agreed the students would be responsible for helping the teacher in various ways after class. This gave the students an opportunity to repair the harm done to the learning environment while also giving the teacher an opportunity to build a stronger relationship with the students due to the conversations taking place while they were working together. Four 6th grade girls between two of our schools were having difficulty with each other, and this was affecting them in class as well as after school with threats being made outside of the school day. 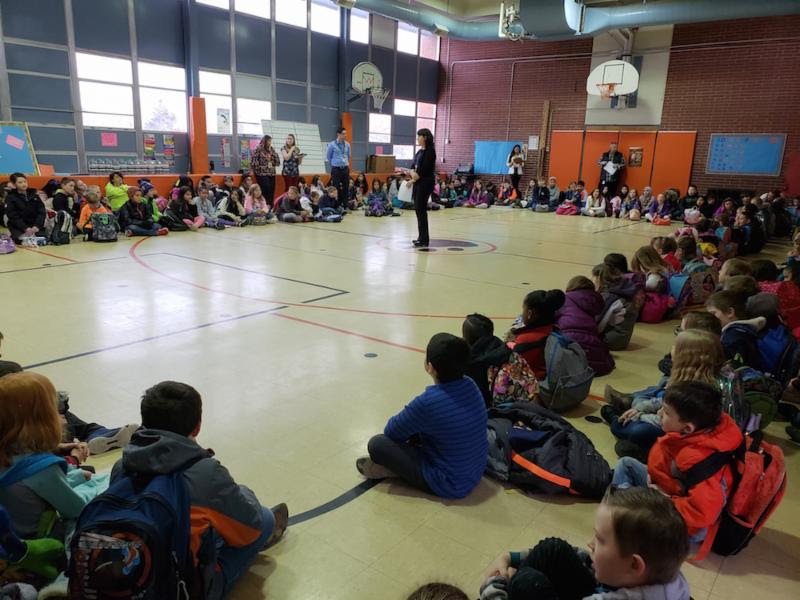 A staff member from each school trained in Restorative Practices held a larger "restorative circle" with all girls as well as a parent support for each girl. Everyone had the opportunity to speak about their concerns, and an agreement was made between all of the girls involved. Both staff members at each school did regular check-ins with the girls for the next month. No other issues came up following this RP conversation/circle. Building strong school culture helps students to belong and thrive and to grow into responsible, respectful, thoughtful, and resilient people. At Englewood Schools, we teach to the whole child, and we believe deeply in the potential for all of our students to learn from their mistakes, find their voices, and become positive role models and influencers as members of our communities.